Don’t you naturally share all the good things you have with your friends? What about all the great things you’ve bought at Zalora PH? Don’t you wish they could do the same too? Encourage friends and family members to try online shopping at Zalora PH and reap benefits in the form of gift vouchers which you can use to shop. 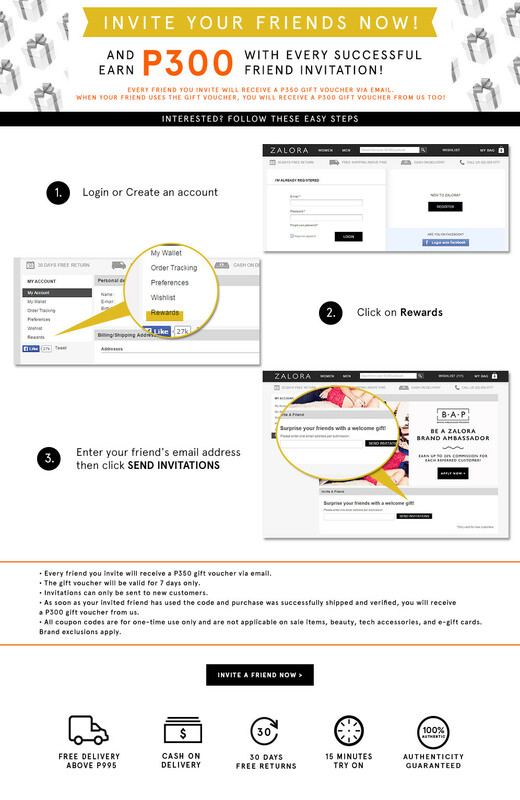 Accumulate more vouchers with every friend who successfully signs up and makes his or her first purchase at Zalora. It’s a generous rewards program you would surely love to forward or pass around. Signing up for the Invite a friend program is simple. You first need to be a registered Zalora PH customer. If you haven’t signed up yet, create an account by logging on to www.zalora.com.ph. If you’re an existing customer, all you need to do is sign in and start inviting your friends and email contacts. The process itself is very simple: each friend you invite will receive a PHP350 voucher which can be used immediately on their first purchase. As soon as the items are shipped and verified, you will also be sent your own PHP300 voucher by email. That’s PH300 for every friend! Imagine how much shopping money you’ll make just by spreading the good word about online shopping. Invite a Friend to Zalora PH today! The invite a friend program is simple, straightforward and truly beneficial to you and your friend. Just remember a couple of important thing: you must refer a friend who isn’t a registered Zalora shopper yet; and second, each voucher must be used on a PHP1500 minimum spend. You can use the vouchers any time but not with other huge sales or discount promos. So what are you waiting for? start inviting friends to sign up today!